Raith Rovers extended the gap between themselves and fifth placed Greenock Morton to ten points, with a hard-fought 2-1 win at St. Mirren. 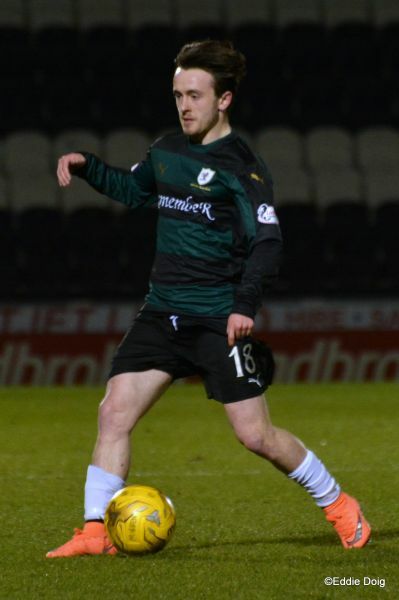 Manager, Ray McKinnon made three changes from the team which pulled off an excellent 2-1 win over Hibernian on Saturday evening. Up front, Ryan Hardie dropped out due to international involvement, allowing Harry Panayiotou his first start since playing on the left-hand-side of midfield the last time these two sides met at the beginning of March. Additionally in the striking department, Mark Stewart dropped to the bench, with Aidan Connolly coming back into the side, and asked to supplement lone-forward, Panayiotou. Lastly, Iain Davidson missed out altogether, which partly explained the naming of just six substitutes in the Raith squad. Davidson’s loss was James Craigen’s gain however, with the ex-Partick Thistle midfielder coming back into the starting fold. 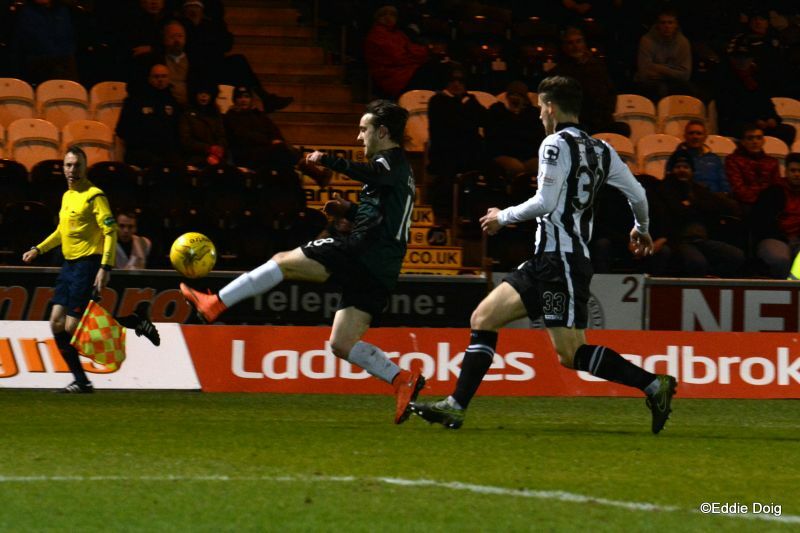 While both of Raith’s in-form strikers missed out, St. Mirren’s Lawrence Shankland, who scored two excellent goals against Livingston in a 3-2 win on Saturday, led the line alongside Alan Gow. 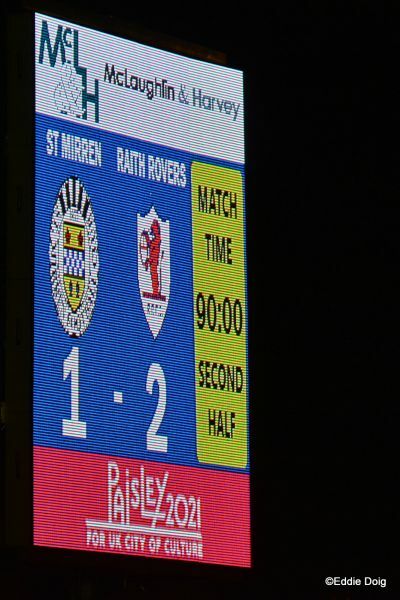 St. Mirren must have taken some encouragement from seeing two of Rovers top goal grabbers not starting, and they almost took the lead after just two minutes, although the chance was created through negligence on Raith’s behalf. Jason Thomson attempted to shepherd the ball out the park, only for Shankland to get a toe to it as it was crossing the line, nudging it into the six-yard box. Rory McKeown and Kevin Cuthbert then seemed to get themselves into a bit of a fankle, and although the ball was bouncing towards the unguared net, it was slow enough for McKeown to recover and steer it to safety. While there was little goal mouth action in the opening stages, it was the home side who probably had the better of possession. Gary Irvine and Alex Cooper in particular looked troublesome down the Buddies left-hand-side, although Connolly got the game’s first sighter of goal after 11 minutes, but his first touch was slightly heavy after a good cross from Panayiotou, allowing Andy Webster the opportunity to clear. 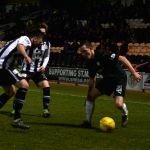 Both teams were playing reasonable football in the game’s opening quarter, with Raith arguably showing the neater touches, although both sides forays were tending to peter out as they approached the the other’s final third. For the home side, both full-backs, Keith Watson and the aforementioned Irvine on the left were getting forward, but it was Cooper who caused the Rovers defence more discomfort after 20 minutes, with virtually the entire Raith back-four attempting to stop him as he made his way along the edge of the area, eventually leading to a penalty shout which referee, Barry Cook wasn’t interested in. Instead, the Buddies were awarded a corner which was delivered too deep. 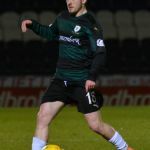 Just how much of a problem that was, was demonstrated within a few seconds, as Raith immediately broke up-field with an inexplicable three-to-one man advantage. Seizing the opportunity, the ball was played to the left-hand-side to Connolly, who outpaced the lone defender, before calmly sprinting into the box and powerfully side-footing the ball past Jamie Langfield to open the scoring. Rovers certainly weren’t looking to rest on the laurels, and while they came close a few minutes later when Louis Longridge slammed a shot into the side netting, they extended their lead with ten minutes of the half remaining. 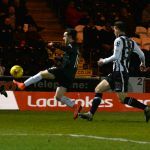 St. Mirren defender, Jack Baird made a real hash of a long ball, seemingly betwixt and between about whether to clear or nod back to Langfield. Unfortunately for the young centre-half, he did neither, allowing Ross Callachan to nip in and stroke the ball past the experienced custodian for two-nil. Raith’s tails were up at this point, and if anything, they looked the likelier to grab a third before the interval, but with Kevin Cuthbert barely tested and just 90 seconds until the interval, Rovers lead was halved. 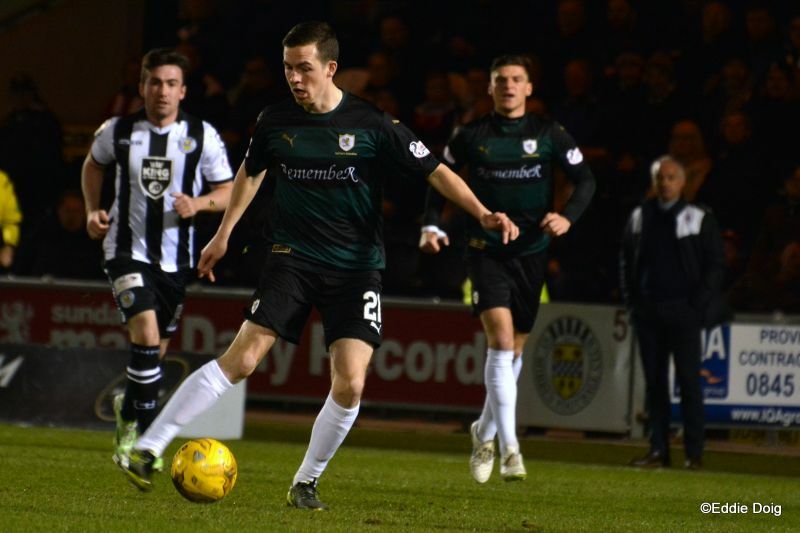 A throw in from Shankland found Cooper, and despite numerous challenges which all seemed to involve Raith defenders falling like skittles, the winger kept his cool and squeezed a shot past a host of players and into the net, to give the home fans a glimmer of hope going into the interval. Ray McKinnon made one change at the break, with Ross Matthews replacing Lewis Toshney. With St. Mirren having a bit of momentum from the end of the first-half, what Raith couldn’t do was give them any easy openings, but that’s exactly what they did five minutes in, when James Craigen’s chest-down went awry, allowing Steve Agnew a dig from distance which was well watched by Cuthbert who nevertheless seemed worried as it bounced just wide. While the first-half had seen some composed football at times, the second seemed more frantic and frenetic, with both teams seemingly happier to get the ball forward quickly, although with little great reward. Certainly chances were at an absolute premium, and the frustrations in the home stands were being reproduced in the home dug-out, with Alex Rae sent to the stand for something he said, although with a plethora of empty seats, this meant he only had to move about six feet further back into the nearest vacant one. 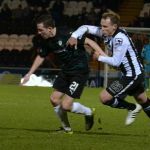 St. Mirren were certainly enjoying the better of the game at this point, but it took until the 73rd minute until Rovers were placed in any great concerns. Shankland’s long throw again caused chaos, and with three attacking players waiting to strike, Thomson’s clearance was a vital one. Joel Thomas was brought on for Panayiotou with a little over ten minutes remaining, but despite the forward’s introduction, it was the home side who fashioned the next chance, and what an opportunity it was. Steven Thomson nodded the ball on to Shankland, who birrled around Kyle Benedictus, but from eight-yards out, he scudded his shot into the ground, and watched in anguish as it bounced wide. If the chance had been taken, it may have produced a grandstand finish, but as it was, Raith held resolute, and reasonably comfortably for the final ten minutes, to take a commanding lead in the play-off spots with just six games of the season remaining. Welcome to the Paisley 2021 Stadium, it's 10 degrees and decidedly more verdant than our postponed fixture back in January. 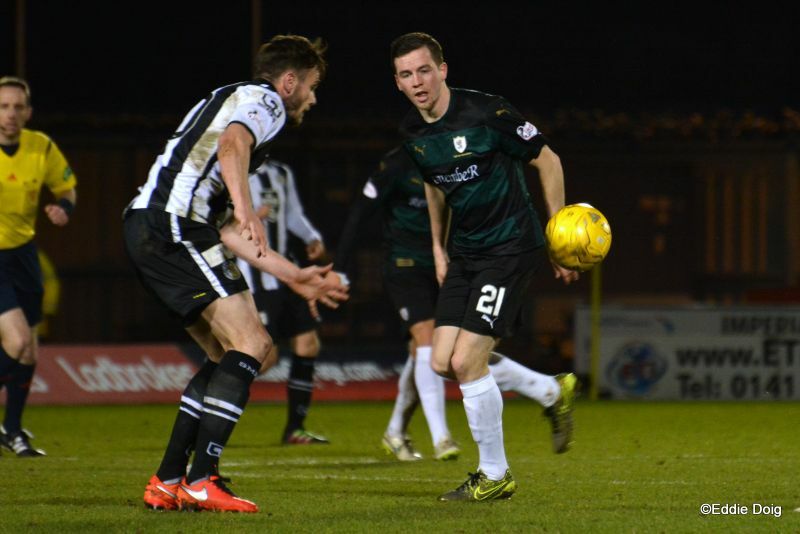 St Mirren share 5 wins in the last 10 league games with Raith but have 4 defeats to our 2. Raith have the upper hand in ties this season with 2 wins and a draw. Hardie is away on international duty and Stewart drops to the bench. A scare in front of goal with McKeowan heading the ball in the path of a Saints player. Signal is poor, please bear with us. First Rovers attack, Connolly lags the ball off to Panayiotou but the pass is to strong and the ball runs out of play. St Mirren putting in a few robust early challenges. I'm back, signal is good again. Play has gone back and forth, Rovers currently defending a corner, bye kick. St Mirren are pressing deep in Rovers territory. The small travelling support taking time out to tell Mr Cook how to do his job. 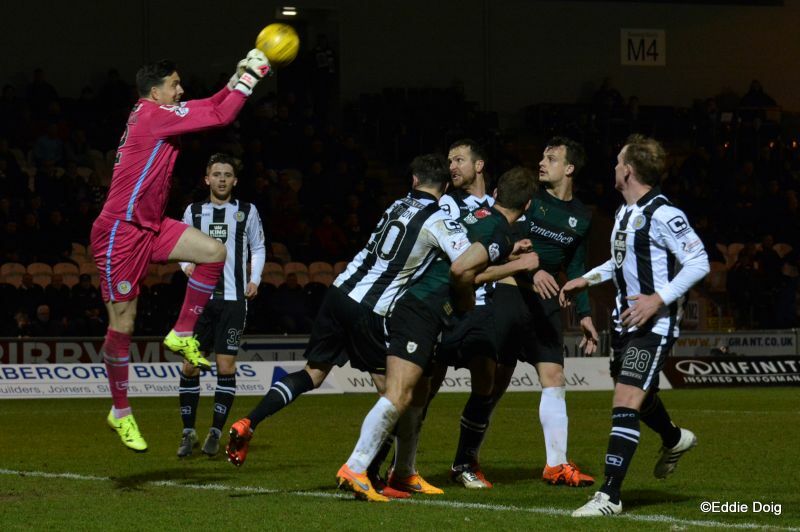 St Mirren tenacious in attack win a corner. From the clearance, Longridge then Panayiotou combining, the latter lays off to Connolly who slots past the diving Langfield. 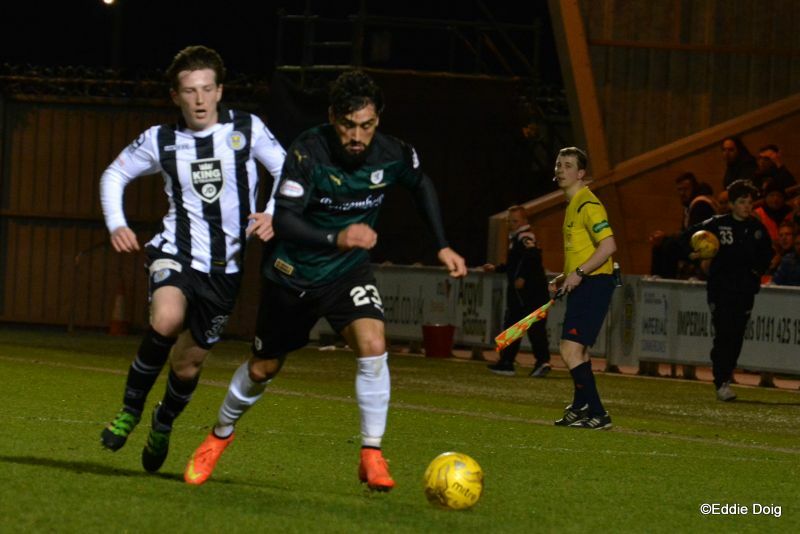 St Mirren pay the price for top loading the attack. The stadium is somewhat muted, the goal stunning the home support as well as the team. Rovers starting to take the game to St Mirren. Panayiotou is impeded by a defender and steamrollered him out of the way when he wouldn't let go of his shirt. Callachan found himself in the center forward slot, beat the lone defender at slots low to the right of Langfield. Cooper the filling in a Rovers sandwich hits a tame shot straight to Cuthbert. Cooper with a low shot from 10 yards. Gow and Baird off, McCallister and Stewart on. Toshney off, Matthews on. Connolly is released by Longridge but shot wide at the near post. Agnew fires wide from 30 yards out. Connolly is presented with a gift from Webster but shot wide. Cuthbert calming things down after a wee bit of St Mirren pressure. The 50 or so travelling fans are giving it laldy. That's the match ball having to pay to get back in. Cooper thundering down the left sees his shot blocked by Thomson. Mr Cook feeling the need to speak to the St Mirren bench then sends Alex Rae to the stand. Connolly lays off a free kick to McKeown who then rattles the ball off the wall. A heart stopping moment as Cuthbert rushes out to head clear 25 yards up the park. Fouls going in all over the place, but none are malicious. St Mirren are having a right good go at drawing level. Gallagher off, Thomson on. Panayiotou off, Thomas on. Barr going to ground courtesy of a Saints player, the ref awards the foul to the Rovers and the crowd go bonkers. Shankland shanks a sitter past the post. Gallagher sailing close to the wind with the ref. A dipping cross from the right sails past a host of players and out at the back post. Some home supporters starting to make their way out. Cuthbert comes out to grab a high ball. +1 Yellow Callachan for kicking the ball away. +2 Yellow Gallagher for dissent. Langfield, Irvine, Watson, Gallagher, Agnew, Mallan, Gow, Webster, Baird, Shankland, Cooper. Subs, Wilks, Thompson, Goodwin, Howieson, McCallister, Stewart, Carswell. Cuthbert, Thomson, Callachan, Toshney, Benedictus, Panayiotou, Connolly, Longridge, McKeowan, Craigen, Barr. Subs, Law, Anderson, Stewart, Matthews, Thomas, Court. 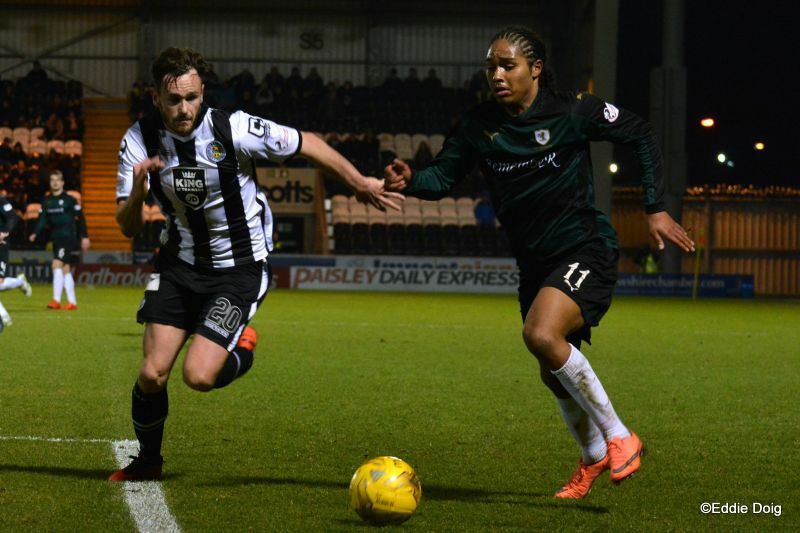 Raith Rovers head to the Paisley 2021 Stadium this Tuesday evening, hoping to take a significant step towards the play-offs, by moving ten points clear of fifth placed Morton, with victory over St. Mirren. 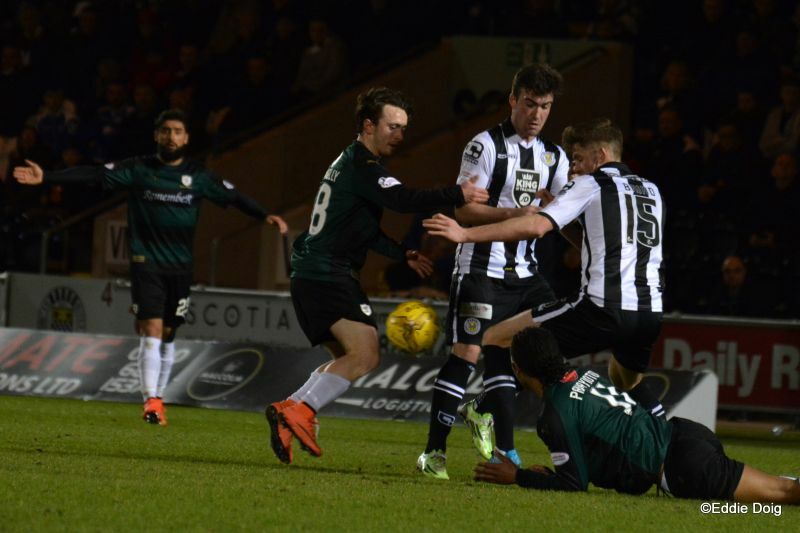 Both teams go into the match in fine fettle, with St. Mirren buoyed by two wins from their last two, while Raith are unbeaten in four, after Saturday night’s excellent 2-1 win over Hibernian, thanks to a solid defensive performance, allied to goals from Lewis Toshney and Mark Stewart. 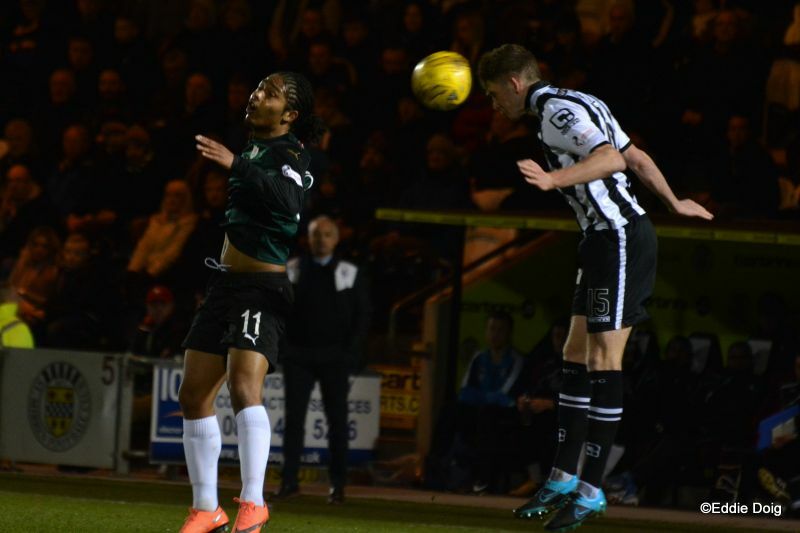 Stewart’s goal continued his productive spell of recent weeks, with the forward plundering five goals from his last seven appearances, taking his tally for the season to eleven. 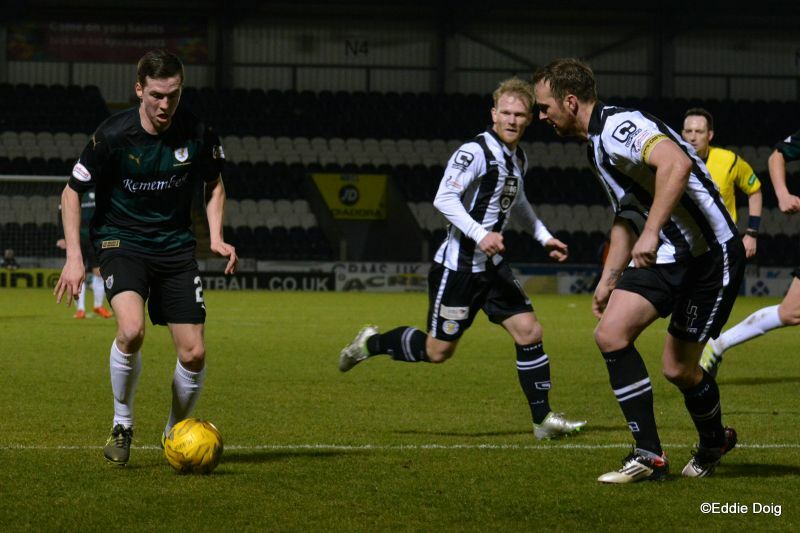 St. Mirren however have their own in-form striker, in the shape of Lawrence Shankland. The on-loan Aberdeen player may not have scored with the regularity of Stewart in recent weeks, but his goal-of-the-season contender on Saturday, his second in the Buddies 3-2 win over Livingston, suggests the 20-year-old is finding some fine form. That’s also true of the team in general since Alex Rae assumed the management role, and incredibly, their most recent home victory, a 2-1 win over Queen of the South, meant that Rae had more home wins in the league than the last three St. Mirren managers, Tommy Craig, Gary Teale and Ian Murray combined. 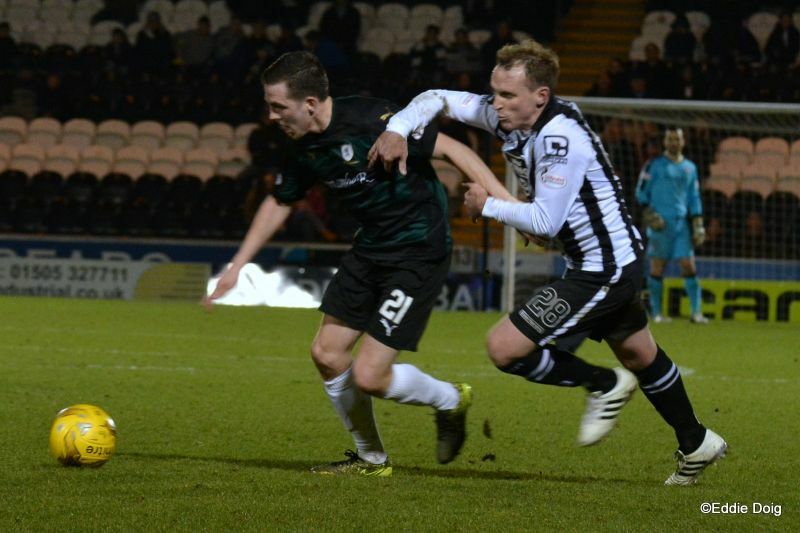 The Paisley outfit are yet to lose a home game this calendar year, although Rovers did manage to inflict one in 2015, thanks to a late winner from Grant Anderson. James Craigen had put Rovers into the lead in the first-half, but a Shankland equaliser in the final moments of the opening period had saw the sides go in level at half time. 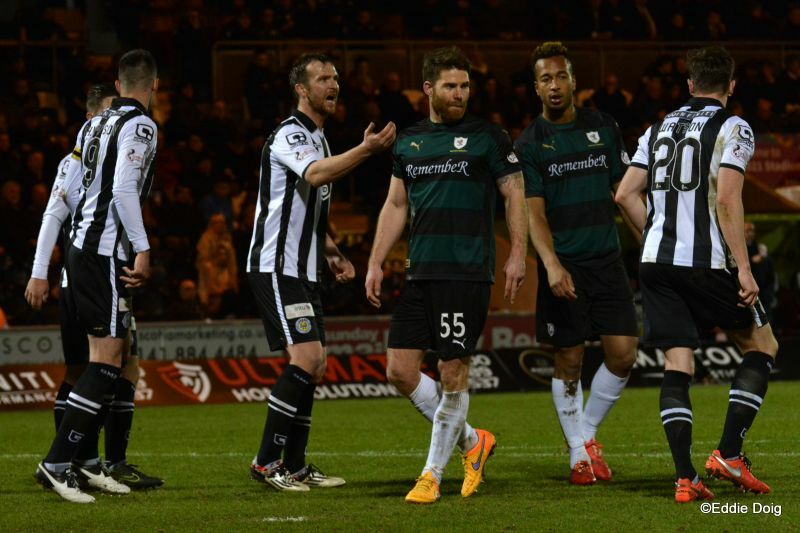 The two meetings at Stark’s Park this season have also saw drama and late goals. 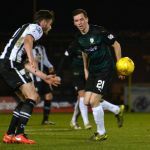 Mark Stewart put Raith ahead in a midweek match in November, only for Steve Mallan to equalise with an exquisite free-kick in injury time, but that was nothing compared to the excitement the last time the sides met at the beginning of this month. A hat-trick from Ryan Hardie and a strike from Mark Stewart had given Rovers a seemingly unassailable 4-1 lead, but late goals from Keith Watson, who managed two on the day, and David Clarkson, led to a tense, fraught finale, with Raith holding on for a 4-3 win. 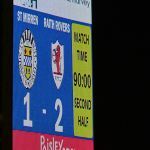 If Raith avoid defeat on Tuesday, it’ll be the first time they’ve went unbeaten against St. Mirren for an entire season since the 1997-98 campaign. a term which saw Rovers pick up twelve points out of twelve against the Buddies. The current good form against St. Mirren means that the recent head-to-head record is all square, with four wins apiece from the last ten meetings.